Do you ever have your meals all planned out and then you get a whiff of something delicious and you want to chuck your current plans and make something else? This week has been a weird week because I worked the weekend/had a day off/started vacation today, so I needed to have enough food for lunches/dinners but not too much food that I would be throwing out stuff before leaving. Over the weekend, I had made pizza that was going to be two days of lunches/dinners. By dinner on Monday night, I was not in the mood for pizza for the fourth major meal in a row. And then my nose caught the scent of crisp rice, ginger, and soy from the Chinese takeaway place down the street. AND I NEEDED CHINESE ASAP. But being the sensible person I am, I reigned myself in and went home and had pizza. But I knew that I needed to make something with all that delicious Asian flavor for lunch on my off day. And this Vegan Green Buddha Bowl was born! 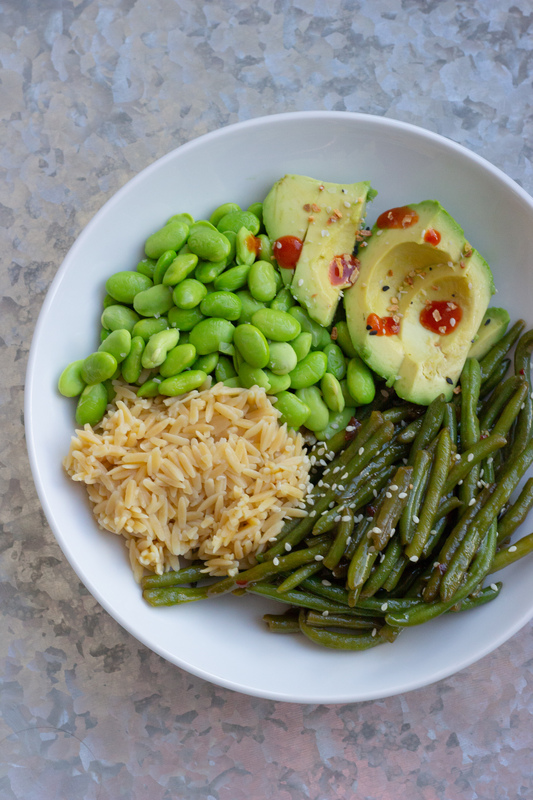 It features Banza’s new chickpea rice and edamame for protein, sautéed brown garlic green beans for the veggie portion, and avocado for the heart-healthy fat! Also, sriracha + avocado is a revelation. This is a big bowl of green greatness! And I pulled it together in less than 30 minutes from start to finish – which makes it perfect for a work-from-home lunch or a quick weeknight dinner! Plus, you can swap out the green beans for bok choy or broccoli if green beans aren’t your thing (but still keeps it in the green theme!). It’s a Vegan Lunch/Dinner Winner! This big bowl of green is loaded with protein, veggies, and heart-healthy fat... oh, and flavor! Garnishes: sriracha, sesame seeds, Everything Bagel seasoning, etc. To make the green beans: heat olive oil in a skillet over medium-high heat. Add in the green beans and cook for 1-2 minutes, tossing occasionally. Add in the red pepper flakes and the garlic powder and stir to combine. Add in the broth, 1 teaspoon soy sauce, and sugar and stir to combine. Taste *caution: mixture is HOT* and add additional soy sauce if needed. Allow the whole mixture to come to a hard simmer. Add in the cornstarch slurry and stir constantly until the sauce is thick and glossy! To assemble the bowls: placed the green beans onto one half of the plate. 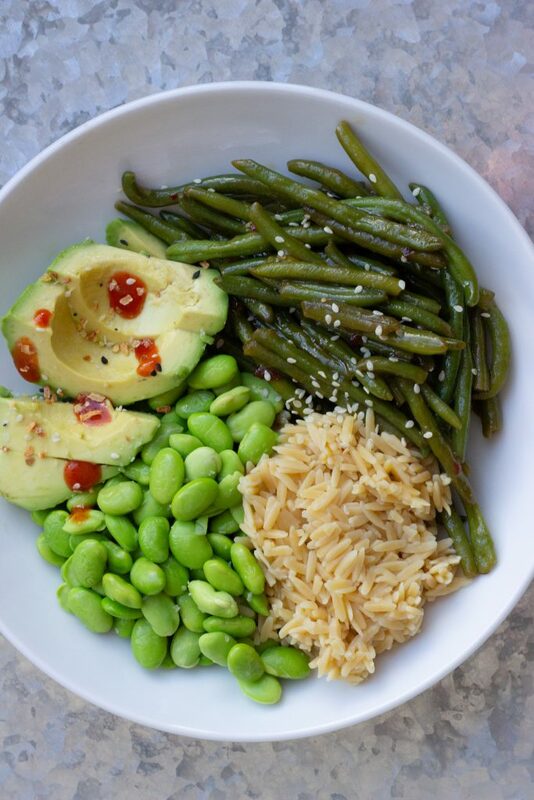 Add the edamame, chickpea rice, and avocado in sections in the second half of the plate. 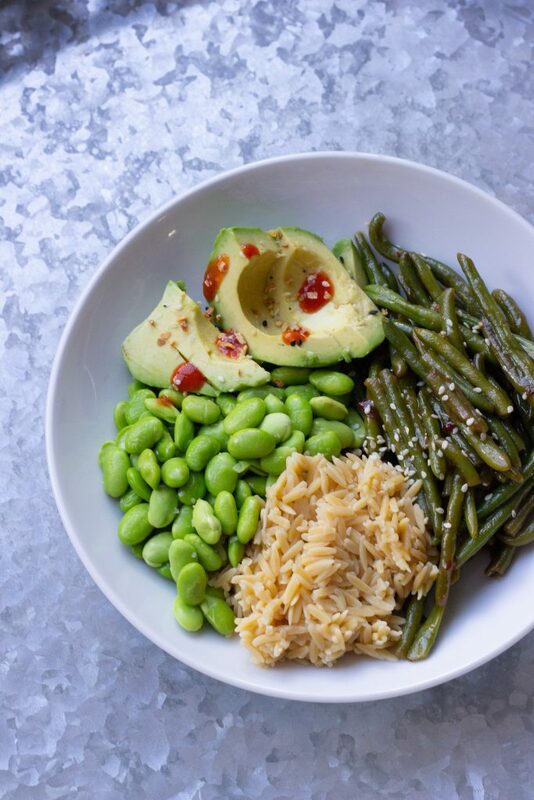 Garnish the green beans with sesame seeds and add a drizzle of sriracha and EB seasoning to the avocado. Then dig in!